This guy gets the problem with tactical training in cops today, but misses on the point that cops don't have a lot of leeway in today's atmosphere of metrics based policing. Really good watch either way. I'm not exactly comfortable with his other message that police officers should choose to not enforce "unjust" laws or not deal with someone who's "ideologically motivated" because they might get hurt. Considering there was just a story about a Florida SWAT member posing for a picture with Pence sporting a f*cking Q badge on his uniform (and all the other stories about police officers being members of white supremacist groups) I don't trust them to determine what laws are just or not or who is politically motivated. And the story he told about the guy in the park was a failure of policing. A clearly mentally and emotionally f*cked up dude--who was armed and ready to commit violence--was left alone by the police. The message was let that landmine blow up on a civilian rather than law enforcement. As a local government employee working for the IT department, I’m given a bit of leeway in interpreting the County’s goals and mission. I don’t know why we shouldn’t give cops similar freedom for acting within the spirit vs letter of the law too. I agree with you OG that a potentially dangerous guy needs to be confronted, but there would be no way the deputy could know that fact on the scene. They determine it now based on whether they are white or black. I too am a local government employee working for the IT department, and I should be given a pistol and training that prioritizes lethal force over other methods of dealing with problems... so I can exercise 'leeway in interpreting' the goals and missions of my position with prejudice. "excuse me Rezzy the IT person, my coffee spilled out of the built in cupholder onto my terminal, and it's acting weird, so i deleted something useless called 'autoexec.bat', can you help me? wait why are you pulling out that pistol..."
I am an IT person working for a state government and think that being able to carry a pistol with the 'leeway in interpreting' my goals means I could eliminate 90% of my recurring IT issues. The guy in the video described the vet as having his Taliban-esque beard along with long hair, said he "looks homeless" and "ate up," and said he has severe PTSD and "problems with authority." The later two should have been exceptionally visible to the deputy, especially if the story is true that the vet was literally seconds away from pulling a gun out and shooting him. I mean I don't think I've ever seen someone who has serious "problems with authority" hide it very well when confronted with said authority and the deputy would have to be extremely dim not to pick up on that. I also think race subconsciously played a part. The guy in the video didn't mention the race of either the deputy or the vet, but it's a safe assumption they were both white (at least the vet). And the deputy clearly gave the vet more leeway than most law enforcement would give an ate-up, homeless-looking minority with behavioral issues and problems with authority (hell, he gave him way more leeway than a black mother carrying her one-year old). And if it came out during their interaction that the guy was actually a veteran, then he probably got a double dose of unwarranted leeway from the deputy. I agree with you that things could have been different if the guy wasn’t White, but angry homeless dude would describe half of downtown Seattle. Should we lock them all up? Maybe the right answer is BOTH the vet and mom are marginalized and deserve help and treatment instead of incarceration? Kudos to the deputy for controlling but not escalating the situation. NYPD should definitely have followed suit. Finally, we have an anecdote being told secondhand by a YouTuber. We have no idea how much the story was embellished. I’d read that he’d had on body armor but can’t see any indications of that now. Something I haven't seen answered: was he targeting women, or did all his victims just happen to be women? I read earlier that he killed everyone in the bank except one person who managed to escape. My guess is it was just coincidence it was all women. Wouldn’t surprise me if that’s wrong though. There are good people on both sides. 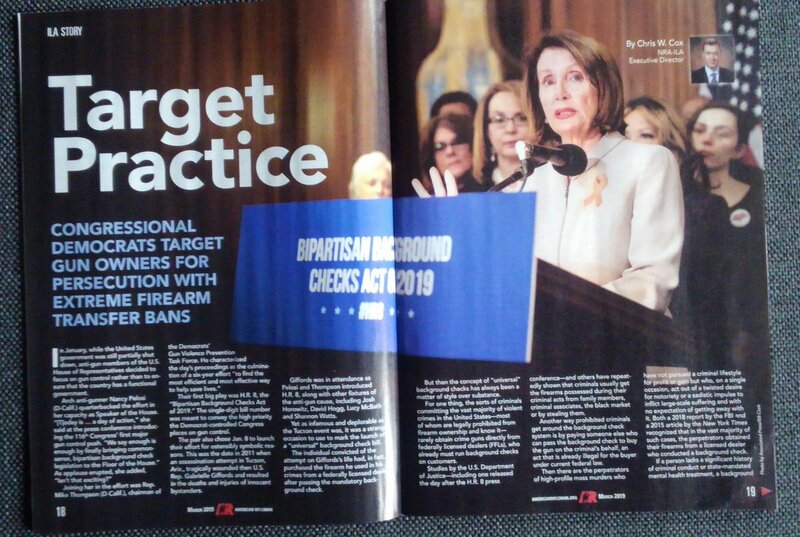 From the latest issue of the NRA's in-house rag, American Rifleman, which reaches 2.1 million exceptionally passionate and ideologically motivated gun owners. That's Rep. Gabby Giffords (D-Ariz.) behind Pelosi. Also firearms transfers SHOULD be banned. They seem to only serve the purpose of getting firearms into the hands of people who would not be able to buy them normally. That sounds okay to me. "Persecution". Y'all don't know what the f*ck that means. Yes they do. We shouldn't give them a pass on using it incorrectly on purpose. Not sure if this belong elsewhere but two mosques attacked in Christchurch in New Zealand. 49 currently dead. Children involved. Suspects have been arrested and no surprises what their motive was. Anders Behring Breivik name might have been mentioned. Curious, does the gun lobby think we should start arming Muslims now? I was in the presence of a Muslim lawyer who is a good friend and colleague when the news broke. Our stomachs sank when we realised the attacks coincided with Friday prayers. Then our next thought was whether there would be accurate journalism to describe it as terrorism. The footage is highly graphic and I suggest not watching it. It is astounding the killer had access to semi automatic weapons, what appears to be assault rifles and multi chamber shotguns. Those weapons aren't in circulation in Australia or New Zealand (killer an Australian citizen from rural town in Australia). This attacker seems to mention Anders Breivik. Breivik got his 30 round magazines from the US. The IRA got their Armalite's from the US. Merely pointing this out. I just want to warn people to please avoid the video of the killer's massacre. It won't make your life any better to watch it. And it is in a lot of places. So just be wary of any suspicious looking video you see. Please don't tell me he filmed everything? And live streamed it to Facebook.